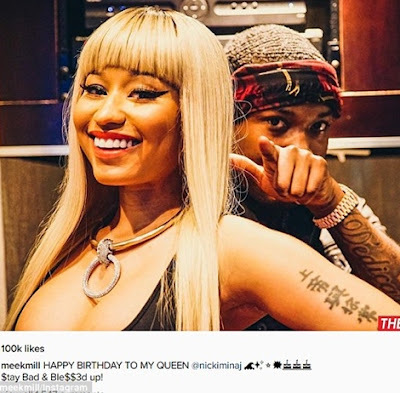 Multi-award winning American rapper, Nicki Minaj, who turned 34 on Thursday, marked her special day with a vacation to Turks and Caicos and an impromptu photo-shoot with her rapper lover, Meek Mill. The rap star who was pictured in a very steamy swimwear which showed her impressive chest and its high cut style, also wore daring red one piece with gold studs which was very low cut on the side, as she lounges in the beach. The birthday girl who also wore a pair of stiletto peep toe booties, also rocked a new hair style with her locks braided and piled up on the top of her head. Posting the picture on Instagram, Nicki said: ‘Lord, I thank you for another year of life. #TurksAndCaicos Birthday vibes. oga boss @kellychi let go bet sharply.